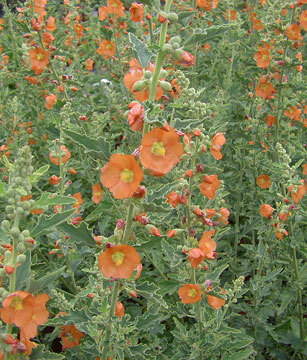 Orange mallow is a plant for gardeners who long to grow the apricot mallow (S. ambigua) of our deserts, but find it too intolerant of wet winters. It is a robust perennial, producing many 2-4 feet stems from the base. Both the stems and undersides of the 2 inch leaves are white-hairy, but the leaves are soft green above. Throughout the summer months and well into fall, it offers a wealth of one inch light to deep orange blossoms, much like those of apricot mallow, opening successively in long clusters. This is a really cheery plant for the summer garden.